Pohickory is derived from the Native American word pawcohiccora--a milk or liquor pressed from pounded hickory nuts. In 1653, "pohickory" was listed as a type of tree found in Virginia. The name "pohickory" was eventually shortened to "hickory." W E S T S P R I N G F I E L D , V A . Location: West Springfield in Fairfax County, Va. Constructed by Levitt Residential Communities, Inc. (ITT). Open for sales January 1972. 1,600 single-family and town homes planned. Prototypes for the Avilla and Norway models are on Route U. S. 50 in Fairfax County, adjacent to Leivtt's Greenbriar community. 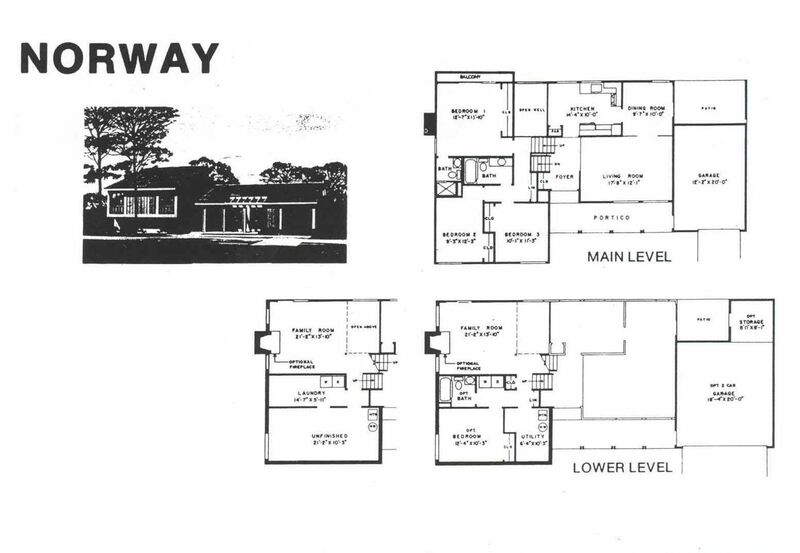 The Greenbriar exhibit area served as the sales office for Pohickory until the on-site exhibit could be completed, which was scheduled for June 1972. 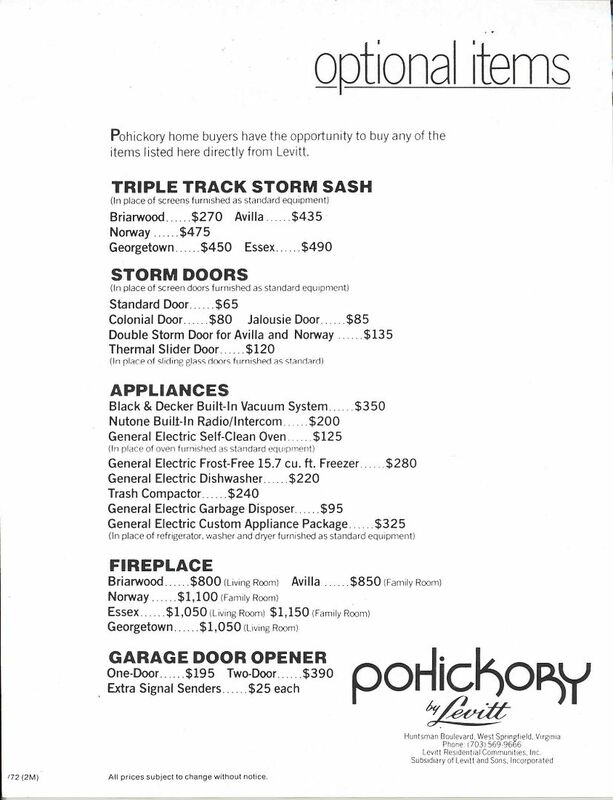 View the list of list of Optional Items for storm sashes, storm doors, upgraded appliances, fireplace, and garage door opener. 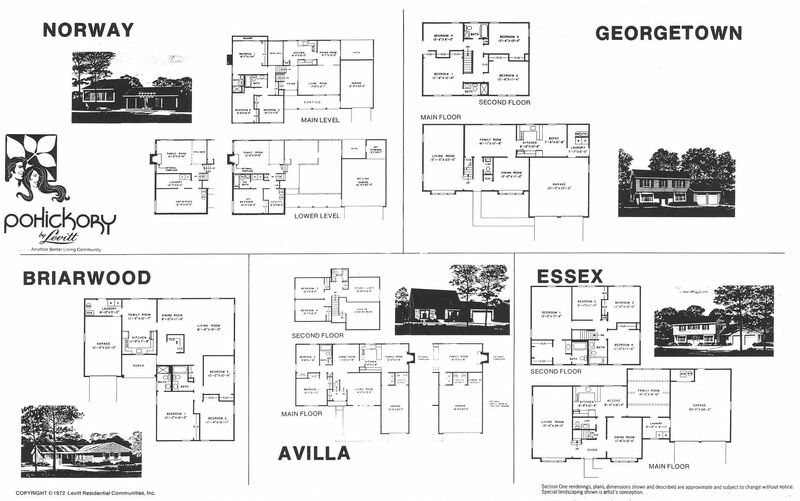 Tour all five sample homes and select the style of your new home in Pohickory. 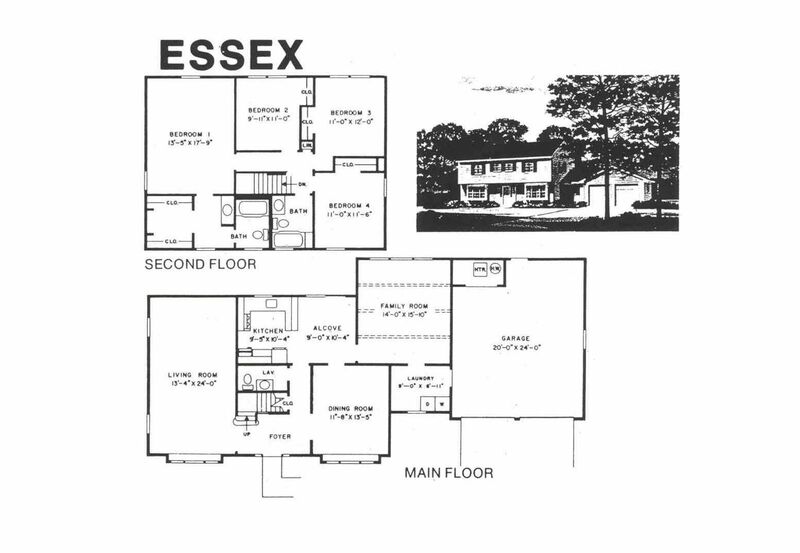 Contemporary 1-1/2 Story (Cape Cod). 4 Bedrooms, 2 Baths, Covered Entry, Double-Door Raised Entry Foyer, Living Room with Cathedral Ceiling and Open Stairway to upper level, Family Room with Sliders to back lawn, Optional Fireplace, Upper Loft overlooking Living Room, Laundry Room with Garage access, One-car Garage with Utility areas, Optional Two-car Garage with Storage area and Expanded Family Room. Rancher. 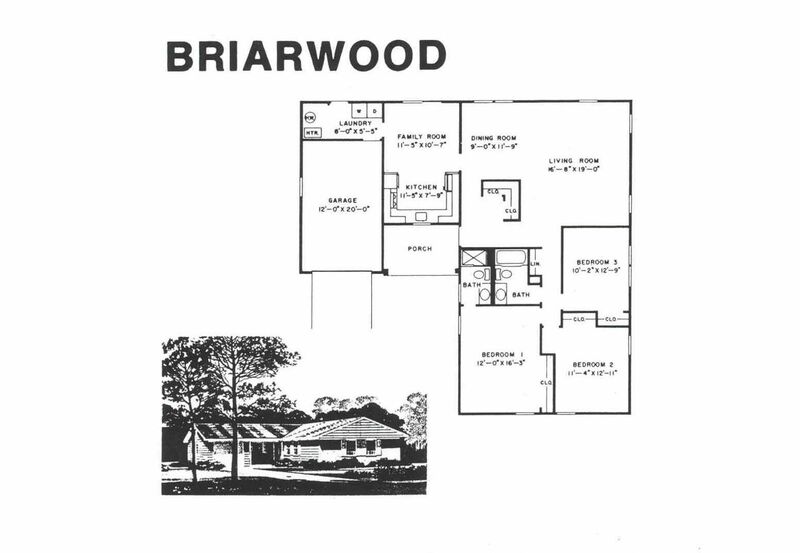 3 Bedrooms, 2 Baths, Brick front, Covered Entry, Entry Foyer with Dual Closet, Living-Dining Room with Optional Fireplace, Front-to-Rear Kitchen-Family Room with Sliders to back lawn, Laundry-Utility Room with Garage access and Service Door to back lawn, One-car Garage. Center-hall Colonial. 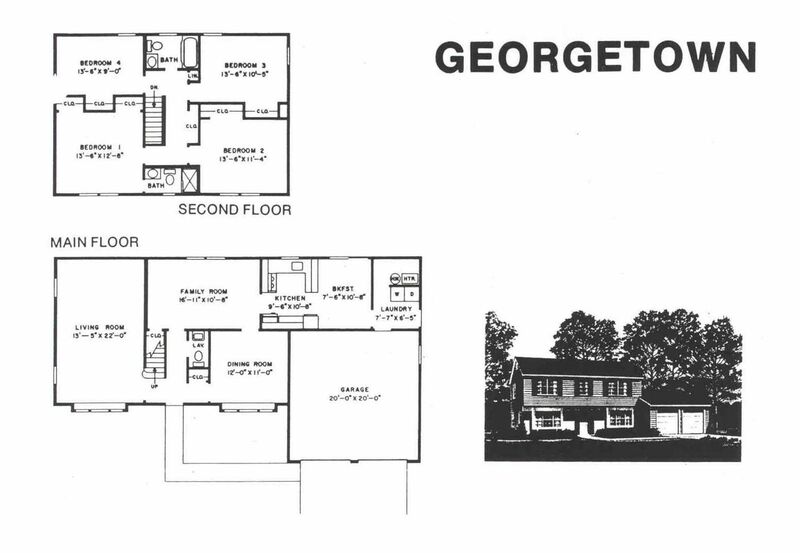 4 Bedrooms, 2-1/2 Baths, Brick front, Entry Foyer, Front-to-Rear Living Room with box window and Optional Fireplace, Formal Dining Room with box window, Kitchen with Serving Counter and Breakfast Alcove with Sliders to back lawn, Family Room with beamed ceiling and Optional Fireplace, Laundry Room with Garage access, Two-car Garage with Utility and Storage areas and Service Door to back lawn. Center-hall Colonial. 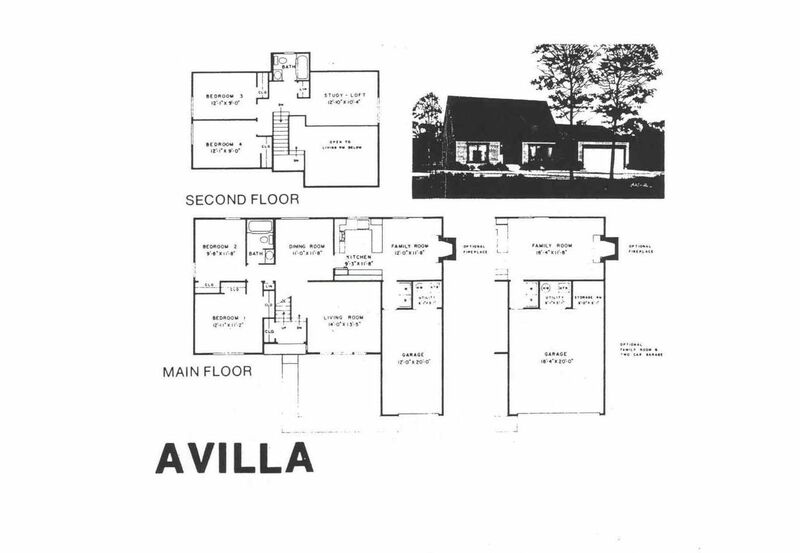 4 Bedrooms, 2-1/2 Baths, Brick front, Entry Foyer, Front-to-Rear Living Room with box window, Optional Fireplace, Formal Dining Room with box window, Family Room, Kitchen with Serving Counter and Breakfast Alcove with Sliders to back lawn, Laundry Room with separate Utility area, Garage access, and Service Door to side lawn, Two-car Garage. Contemporary Split Level. 3 Bedrooms (Optional 4th Bedroom on Lower Level), 2 Baths (Optional 3rd Bath on Lower Level), Covered Entry, Front Portico with Open Beamed Skylight, Raised Entry Foyer, Open plan with Balcony and Cathedral Ceilings, Family Room with Sliders to back lawn, Optional Fireplace, Kitchen with Alcove, Dining Room with Sliders to Corner Patio, Rear Corner Patio with Open Beamed Skylight, Upper Foyer Balcony overlooking Family Room with Clerestory Window, Master Bedroom with Sliders to Balcony overlooking back lawn, One-car Garage with Service Door to front portico, Optional Two-car Garage with Storage Area and additional Service Door to Corner Patio. View press releases and news articles for Pohickory. View original newspaper sales advertisements for Pohickory. 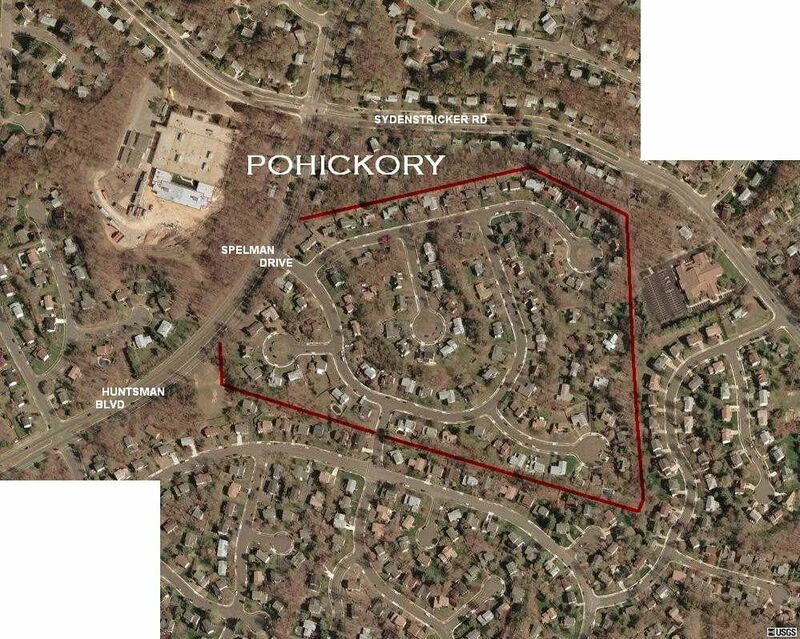 The initial press release for Pohickory announced a $60-million community on a 648-acre tract. Of this acreage, approximately one-third would be preserved as open space, including a 25-acre lake that was already under construction with planned lighted trails, picnic area, lakeside gazebo, and boat dock--all by Levitt and Sons, and a 50-acre regional park to be developed by the Fairfax County Park Authority. Ultimately, only 98 homes were built before the project was closed out. With only 98 homes, Pohickory is the smallest post-Levittown community that LB.com has come across. The Optional Items list refers to Section One, and all of the streets in Pohickory begin with the letter S, suggesting, of course, that the plans for Pohickory were much larger than the small section that was built and that separate neighborhoods were likely the concept with an alliterative street-naming convention. Even though Pohickory ended up being a smaller community, Levitt maximized the number of homesites possible through the use of "flag" lots and shared driveways. A flag lot is essentially a lot behind another lot. Typically, a long driveway between two other lots extends behind one of the lots where another lot is then created. The only street frontage is at the driveway entrance and the front lot has another home directly behind it, sometimes with its front facing the backyard of the front lot. The main part of this additional lot forms the "flag" and the driveway extending to the street forms the "pole." In Pohickory, several additional lots were also created using shared driveways that extend off the end of a street. The shared driveways are used to access homesites beyond the street, but require less width, since they are not public roadways, and different setback requirements apply. It is estimated that these lots created an additional five homesites that would not have been possible by extending public streets, with additional right-of-way and setbacks that would have been required. Much of the land immediately to the south of Pohickory, but north of the lake, was developed by Centex Homes beginning in 1976. Portions of the remaining land of the original 648 acres were developed as Lake Forest and Woodlake by Levitt Homes in the late 1970s and early 1980s. The remaining land likely was part of the purchase of Levitt and Sons assets from ITT by Starrett Homes after ITT's divestiture was completed. Page last revised 16 September 2012.